First, about Serial. I’m sure I’ve mentioned Serial before – it’s an NPR podcast that took an in-depth dive into a crime that took place in 1999. A high school girl named Hae Min Lee was murdered and her body was found in Leakin Park, in Baltimore. Her boyfriend Adnan Syed was convicted of the crime and sentenced to life plus 30 years in prison – he is now 35 years old and has served 17 years. Some believe that Syed’s defense attorney did not represent him to the best of her abilities; a star witness with a solid alibi for Syed was not asked to testify in his trial. Serial explored the details of the case and the shortcomings of Syed’s defense attorney in a riveting “told week by week” format. If you haven’t yet listened to the first season of Serial, go now! Do it! I began to listen to season two but didn’t find it as interesting, however there are a few episodes that revisit the Adnan Syed case because it was appealed in early 2016, so make sure to listen to those. Note: In the days after I wrote this post, I heard that Adnan Syed has been granted a new trial! I look forward to following along with the case as it continues to develop! This is my new favorite true crime podcast. Hosted by Mike Boudet, this podcast has excellent production value and great music and covers fascinating cases. Some of the episodes include real 911 phone call recordings, which are extremely eerie and bring the cases to life. 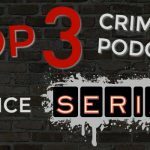 As this podcast generally covers one case per episode, you don’t necessarily need to start at the beginning, so here are my favorite episodes to get you started. Warning: some are very disturbing. I only started listening to this podcast because it publishes episodes on the off-weeks of Sword and Scale. Guilty as charged, but turns out it’s pretty great! I found out about this podcast through Reddit (where I find out about…everything basically) because the host is a fellow contributor to the same crime subreddits I frequent. The podcast covers little-known cases that are unresolved, giving as many details as are available about the case and then speculating about some plausible answers. Since these are cold cases, they often lack some detail so it can be a little unsatisfying, but it’s still fun to try to guess what might have happened. Episode 7: Judy Smith accompanies her husband on a business trip but goes missing. Her skeletal remains are found states away, five months later. Episode 9: Don Kemp leaves his NYC ad executive life behind and his abandoned car is found in Wyoming. It’s four years before his body is found, and in the meantime, a friend receives bizarre phone calls from him. This podcast is one of my best-kept secrets because it’s not quite as popular as some others, but it keeps improving as it gains tenure. I love the intro music they picked and that they’re trying new things like reenactments to add some flair. Many of the cases covered take place in Australia or New Zealand, so they’re new to me and it’s interesting to hear about how the justice system works overseas. I recommend listening to early episodes of this podcast on headphones rather than in the car because the audio quality can be poor. Episode 16: Who killed 3-month-old twins Chris and Cru Kahui? Episode 17: Police are dispatched to the side of the highway where adult female twins are standing calmly. Soon, the situation becomes frightening. Any other crime podcasts I should be listening to?